Airplane will always be the original Zucker/Abrahams absurdity, and there were a few other notable efforts in-between, but for me The Naked Gun is the pinnacle of their deadpan genius, and there is nothing you can suggest that will ever change my mind. There are perhaps a number of reasons for my particular bias, but the most telling is the fact that I saw The Naked Gun long before I did its puerile predecessor, and by the time I got around to finally seeing Airplane – of which I had acquired lofty expectations – the comedy seemed just a little watered down by comparison. As sharp and as influential as the original Zucker/Abrahams creation was, The Naked Gun seemed to take it to the next level. This is Frank Drebin, Police Squad. Throw down your guns, and come on out with your hands up. Or come on out, then throw down your guns, whichever way you wanna do it. Just remember the two key elements here: one, guns to be thrown down; two, come on out! It all began with a short-lived TV show named Police Squad! 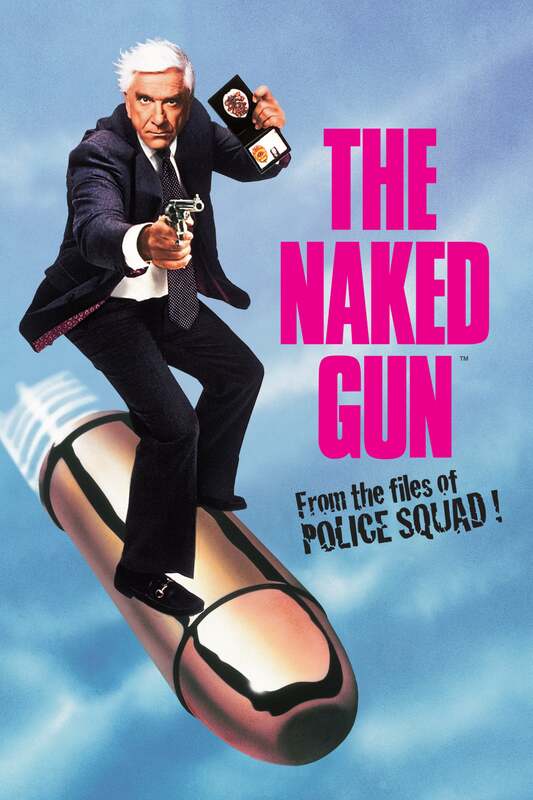 — an underdeveloped blueprint for what would become known as The Naked Gun series. There were only six episodes aired — an incredibly short run for a TV series — but it certainly made an impression, receiving two Emmy Awards for Outstanding Lead Actor in a Comedy Series (Nielsen) and Outstanding Writing In A Comedy Series. This was two years after Airplane!, and the show had a similar gag ratio, one that the Abrahams/Zucker team would considerably up by the time its silver screen offspring hit theatres six years later. ABC entertainment president Tony Thomopoulos would attribute the show’s cancellation to a mainstream audience who, “had to watch it in order to appreciate it.” As silly as the whole affair was, its quick wit and blink-and-you’ll-miss-it gags were too much for a mainstream audience back in 1982. It’s not surprising. TV has come a long way since The Sopranos at the turn of the millennium, and even before then with the likes of Hill Street Blues, a comparatively conventional prime time show that required more than just a passing glance. Comedy TV in the the early ’80s was predominantly situation-based and invariably accompanied by canned laughter, an audio cue that told people exactly when to laugh. Police Squad! was a whole other entity. It challenged people to think, to discover humour in places they weren’t used to finding it. Almost a decade later The Simpsons would take a similar format mainstream. Before then, animation was considered a medium exclusively for children, and many adults struggled to break down those barriers, seeing but not hearing, being aware but not really taking it in. Police Squad! served up a similar paradox. On the surface it was transparently dumb, when in reality it was sharper and more quick-witted than the vast majority of American television. The same can be said about The Naked Gun series. I was eight years old when I first discovered the original movie, and I found it as side-splitting then as I do now. There is something about its absurd brand of comedy that is so universal, something so fundamental that it can be enjoyed by all ages and cultures. How can one not laugh at the sight of a straight-faced detective borrowing a criminal 20 bucks so he can bribe [him] for answers in return, or that same detective shooting at his own car and asking citizens for a make on the registration plate as it careens toward a path of wanton destruction. If you played that scene to a member of the world’s most disconnected tribe, I guarantee you it would at least raise a smile, regardless of how remote their understanding of the culture. The Zucker/Abrahams formula is so irresistibly simple it is amazing nobody thought of it before they unleashed the likes of Frank Drebin onto the cinematic landscape. Before his transformation into the comedy icon he is now so fondly remembered as, Leslie Nielsen was a serious actor who had never been near a funny role, but the transition was hardly one of intensive labour. All he had to do was exactly what he had been doing his entire acting career: play it straight. The hardest part of his job was trying not to burst into laughter as gangs of decorators tumbled from background scaffold or prisoners pole-vaulted their way to freedom over the prison yard walls. That’s not to say Nieslen wasn’t a genius – there isn’t a man in the world who could carry those movies the way he did – but underwhelming roles in tepid imitations such as Spy Hard and Dracula: Dead and Loving It proved that there was much more to The Naked Gun franchise than our leading man’s irresistible star turn. The obvious hallmark of the series is its wonderful juxtapose of straight-faced seriousness and inane stupidity. So effective are the reams of absurd dialogue and comic set-pieces that the plots of all three movies, themselves as blatantly farcical as you could ever strain to imagine, almost pale by comparison. There is something about serious people stuck in silly situations that really connects with modern day humanity, particularly when those people are seemingly unaware of what is going on around them. In spite of his almost total disconnection from reality, Frank Drebin proves to be one of cinema’s most relatable characters, a man so mired in his own inadequacies that accidental heroism is the only foreseeable outcome. Avoiding failure with a nonchalance that he is never quite aware of, he is somehow able to shrug off the perils of fate, accepting his legacy as the precinct’s most dedicated cop as a dog accepts his place at the foot of a bed. Whether he succeeds is not the question. It is the manner of his success that we pay to see. Lt. Frank Drebin: [narrating] The attempt on Nordberg’s life left me shaken and disturbed, and all the questions kept coming up over and over again, like bubbles in a case of club soda. Who was this character in the hospital? And why was he trying to kill Nordberg? And for whom? Did Ludwig lie to me? I didn’t have any proof, but somehow, I didn’t entirely trust him either. Why was the ‘I Luv You’ not listed in Ludwig’s records? And if it was, did he know about it? And if he didn’t, who did? And where the hell was I? In spite of the movie’s juvenile idiocy, it is rich with effective variation — all of it borrowed, but never cheapened. We have that brand of ludicrous physical comedy reminiscent of Laurel and Hardy, a screenplay of spellbinding absurdity, and a cast so attuned to the movie’s slapstick vision that you come to love them like family, regardless of how flimsy their characterisation. Drebin narrates his story like a two-bit lead in a classic noir flick, albeit one who performs a little hopscotch while sombrely musing, and expressions of straight-laced confusion beautifully embellish the Zucker/Abrahams formula. If by some incredible stroke of misfortune you are still unfamiliar with the series, imagine Humphrey Bogart, as moody and as debonair as you remember him, delivering voice-over similes such as, “It’s like eating a spoonful of Drano; sure, it’ll clean you out, but it’ll leave you hollow inside”. The buddy cop dynamic of Drebin, Ed and Nordberg, who spend their days drinking urine samples and wrestling the queen while the bad guys run amok, is one of the most endearingly unconventional ever devised. In the world of The Naked Gun, and only in that world, Frank is the brains of the equation, a leader who goes unquestioned in spite of his debilitating clumsiness and propensity for self-sabotage. In 1991‘s The Naked Gun 2½: The Smell of Fear, Frank diffuses a bomb by tripping over the plug and releasing it from the socket. Moments before, Ed accidentally pushes surreptitious Hexagon Oil executive Quentin Hapsburg (Robert Goulet) out of a ten storey window as he’s about to give up the code, a gaff which almost leads to the perpetrator’s escape until a lion pounces out of nowhere and mauls him. 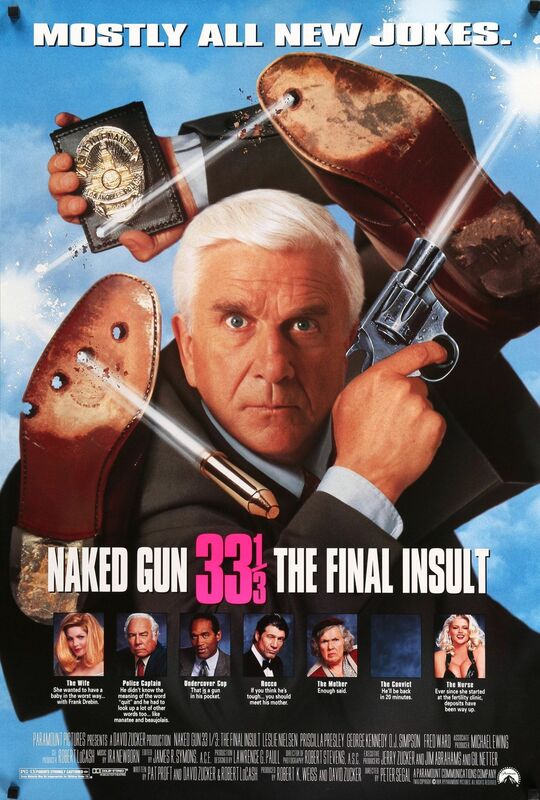 As a unit the three are dumb, dumber and dumber still, but ignorance inspires fearlessness, and the cast of The Naked Gun somehow manage to make it the trademark for success. Lt. Frank Drebin: It’s the same old story. Boy finds girl, boy loses girl, girl finds boy, boy forgets girl, boy remembers girl, girls dies in a tragic blimp accident over the Orange Bowl on New Year’s Day. The reality is, you would have to be inhuman to ‘rise above’ The Naked Gun’s unrelenting farce for more than five minutes, regardless of how seriously you take yourself. 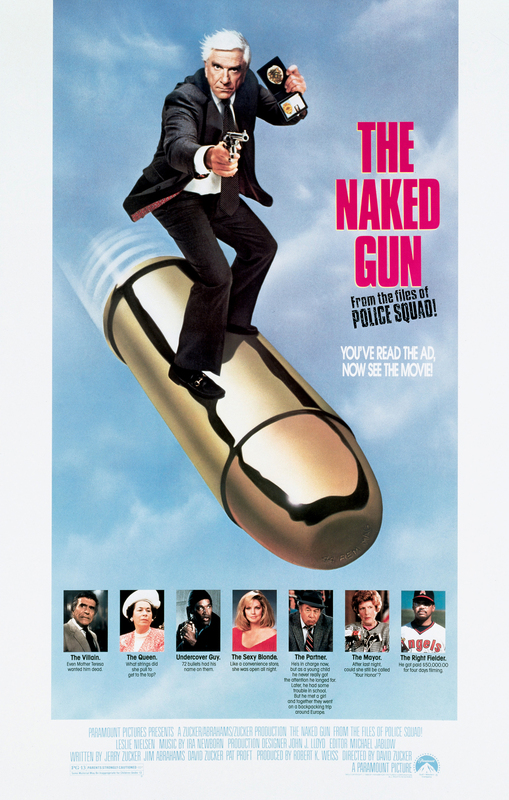 There are movies that are so immature some of us refuse to stoop to their level, and then there is The Naked Gun. I have watched the series with some pretty humourless people, and by the end of Drebin and co’s juvenile escapades, those in question have gone on to experience something of a renaissance, a kind of uncontrollable regression into the throes of childhood, and that is essentially what the series is about, rekindling the lost child in all of us, stripping away the debilitating deadwood of adult responsibility and once again making laughter and enjoyment our one and only concern. In those terms, The Naked Gun movies are perhaps the funniest and most liberating of all. In the near thirty years since the original film’s release there have been a plethora of imitators, but all they have served to do is highlight just how tricky this simple formula is to get right. Even away from the realms of its inimitable formula, for unabashed joy and belly-aching laughter nothing has come close, and it’s hard to imagine that anything ever will. No doubt, I really get a kick out of this trilogy’s formula (heck, I’ve heard The Final Insult has its detractors, but I think the likes of Fred Ward & Kathleen Freeman spoofing it up is great…actually, “It’s the bomb!”). Agreed. The third instalment really misses the mark on occasion, but it also gives us some of the best scenes and gags in the series. The prison narrative is gold, as is the Academy Awards ceremony for the most part. The sperm bank scene is mostly unfunny and feels forced, but the scene afterwards with Frank and Jane… again, pure gold.